Quote Me is a free Windows 8 quotes app and it is available under the ‘Books & Reference’ section of Windows 8 app store. This quotes Windows 8 app gets you a collection of more than 30,000 amazing quotes by known and unknown authors. You can easily get a new quote by clicking the left mouse button on the quotes app screen. You can also ‘save to image’ a quote that saves it to your local picture library. In addition, there are options to copy a quote, like a quote, pin to start a quote, refresh it, or just share a quote with others, from within the app. The interesting part about this quotes app for Windows 8 is that it allows you to filter quotes by your favorite authors. Once you do it, the app will then bring you quotes by those selected authors. 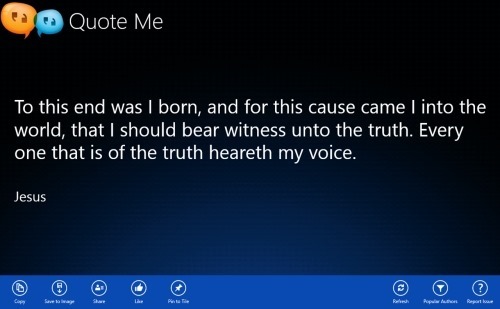 The quotes provided by this Windows 8 quotes app are extremely inspirational that let you learn something new everyday. Let me quickly point out the main features of this quotes Windows 8 app below. Comes with a collective of over 30,000 inspirational quotes. Lets you pin to start quotes. Lets you save a quote as an image to your local picture library. Comes with options such as copy a quote, refresh, like a quote, or just share it with others, from within the app. Lets you filter quotes by your favorite authors. Well… I really liked this quotes Windows 8 app where you get thousands of motivational quotes without searching over the Internet. You can pin to start a quote, like it, copy it, or just share a quote with others, from within the app. You can pick a highly inspirational quote, post it as you Facebook status or just Tweet it, and get maximum number of likes. Thumbs up to Quote Me Windows 8 app. Also, check out our posts on eBook Apps, Language Translator Apps, and Encyclopedia Apps. In order to install this Windows 8 quotes app in Windows 8, you need to head over to the app store and open the Windows 8’s Search Charm (press ‘Win+Q). Now, type the app name i.e ‘Quote Me’ and hit Enter. You can now proceed with further installation steps. In short, Quote Me is a good utility Windows 8 app to get inspirational quotes everyday. Go ahead and download Quote Me app in Windows 8 now. Recent update will now allow searching in the application as well.